The AMADEUS STAR will be the next highlight of our fleet from April 2019. The new ship offers a total of 70 spacious deluxe cabins and 12 AMADEUS Suites. Similar to our other ships, the AMADEUS STAR cabins on the Mozart and Strauss Deck also feature lowerable panoramic windows which extend across the entire cabin front and have been specially designed for the AMADEUS ships. All deluxe cabins and suites offer comfortable, spacious bathrooms, infotainment systems, flat screen television, telephone, cabin safe, minibar and air conditioning which can be individually regulated. Furthermore, the suites feature walk-on external balconies with seating. 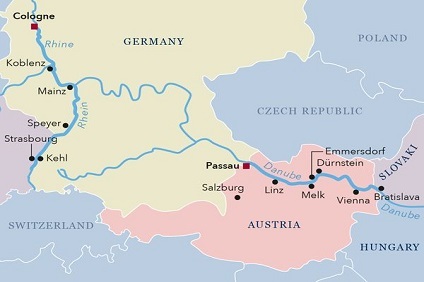 7 Night Cruise sailing from Budapest to Passau aboard Amadeus Star. 9 Night Cruise sailing from Vienna to Bucharest aboard Amadeus Star. 9 Night Cruise sailing from Bucharest to Vienna aboard Amadeus Star. 6 Night Cruise sailing from Vienna to Nuremberg aboard Amadeus Star. 6 Night Cruise sailing from Passau roundtrip aboard Amadeus Star. Suite (26.4 m² / 284 sq.ft.) with walk-out exterior balcony. Comfortable corner sofa, luxurious bathroom, walk-out exterior balcony, mini-bar, walk-in wardrobe, choice of bed configuration (double or twin bed), flat-screen television, individual climate control, en-suite bathroom with shower/WC, bathrobe, hair dryer, direct dial telephone and in-room safe. A-1 Cabin (17.5 m² / 188 sq.ft.) with drop-down panoramic window. Spacious bathroom, drop-down panoramic window, mini-bar, walk-in wardrobe, choice of bed configuration (double or twin bed), flat-screen television, individual climate control, en-suite bathroom with shower/WC, hair dryer, direct dial telephone and in-room safe. B-1 Cabin (17.5 m² / 188 sq.ft.) with drop-down panoramic window. Spacious bathroom, drop-down panoramic window, mini-bar, walk-in wardrobe, choice of bed configuration (double or twin bed), flat-screen television, individual climate control, en-suite bathroom with shower/WC, hair dryer, direct dial telephone and in-room safe. B-4 Cabin (17.5 m² / 188 sq.ft.) with drop-down panoramic window. Spacious bathroom, drop-down panoramic window, mini-bar, walk-in wardrobe, choice of bed configuration (double or twin bed), flat-screen television, individual climate control, en-suite bathroom with shower/WC, hair dryer, direct dial telephone and in-room safe. C-1 Cabin (16 m² / 172 sq.ft.) with panoramic window. Spacious bathroom, small panoramic window (cannot be opened), spacious wardrobe, choice of bed configuration (double or twin bed), flat-screen television, individual climate control, en-suite bathroom with shower/WC, hair dryer, direct dial telephone and in-room safe. Cabins with connecting doors are available on request. C-4 Cabin (16 m² / 172 sq.ft.) with panoramic window. Spacious bathroom, small panoramic window (cannot be opened), spacious wardrobe, choice of bed configuration (double or twin bed), flat-screen television, individual climate control, en-suite bathroom with shower/WC, hair dryer, direct dial telephone and in-room safe. Cabins with connecting doors are available on request.